On June 1st 2017, a little superhero’s brother was born. 7lbs 8oz and an easy and fast delivery, we are very proud to announce Mason’s baby brother & our new little addition Miller Mase. It was a beautiful day full of love, support and of course Mason. Windsor Regional Hospital second floor Labour and delivery nurses &staff blew us away with amazing care, and such personal touches. 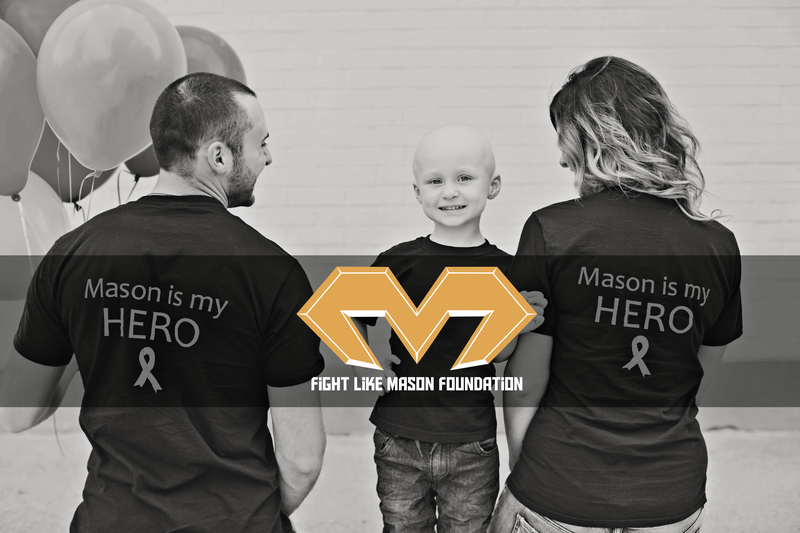 From Miller’s own M logo on the door to everyone wearing Fight Like Mason gear, we felt so honoured and grateful to have you all apart of that very special day.Lots of hugs and thank you’s go out to all of you!! We are now settled at home, but of course our first stop was to see Mason, and have our boys be in the same place together. The four of us were a complete family, finally all together in one place. It was beautiful to have our boys in the same spot, yet so hard to not be able to have them meet in person. Miller Mase, you have added so much love to our family, you filled our once very broken hearts with so much love that we thought could never be possible. Mason would be so proud to show you off and tell everyone about his new baby brother. Welcome to the world baby Miller. He sure is cute and does look like big bro!! Congrats on the beautiful baby boy ..
And to be born on June 1st, not May 31st, that was Mason shining down and telling the universe you needed happiness and not just sorrow in June. Congrats lady xo I hope we can have a playdate sometime with our two babies! Congratulations on your beautiful baby boy! Mason will always be with all of you. Congrats this is so beautiful and precious!!!! So very happy for you all. Mason will always be with his baby brother. He is in your hearts you carry him every where. God bless you all enjoy your special little gift. Welcome to the world Miller. Congratulations Chantelle and Iain! It makes me very happy to see that little Miller could bring you back this great feelings, you deserved! Mason will always be with you and watch the family! Congratulations on the safe arrival of Miller. What a blessing to your whole family and Mason, I’m sure is one proud Angel! Best wishes! Enjoy your new little addition! Congratulations to all of you. Mason and Grampa Bill are looking on and smiling for sure! Wishing you love and good health always!